Forgot to mention it a couple days ago...but I enjoyed a Famous Nic 3000 courtesy of Blak Smyth late last week. Thanks Shane! Hey hey, your more than welcome. Let me know if you need another! Mac turned me onto the 5000s, I am gonna check on them at the December 10th Famous/Leaf herf! Davidoff Panatela Vintage 2000 - year was 2003. Freking awesome. Tatuaje Petite Cazadores Reserva - thanks to EricF. Definitely made the top 5 short smoke list. Thanks again for the awesome experience. Anejo 48 from '07 thanks to Emopunker04. WOAM - thanks for EricF. ...RGD. A La Aroma de Cuba. Thanks Ron, very tasty! Alec Bradley Family Blend - thanks to Marlon K.
A fresh rolled Roxy Maduro Robusto from Andrew (BlkDrew). Thanks again Andrew!! ...fissure! A great Juan Lopez #2 from 2005. Thanks Steve! Thanks for the TAA brother, it was very tasty, lot's of chocolate. The first two thirds where great but the last third was packed with tar. I will pick up a couple more of these and let them rest for some time. I also smoked a La Aurora 2nd (Thanks to Kevin @SavorTheStick), I thought it was a good mild flavored stick. Having a very nice PSP1 courtesy of Donald (Stogeyfish). Thank you again my friend. EricF - thanks again; ever since our trade I have been sampling one awesome smoke after another. 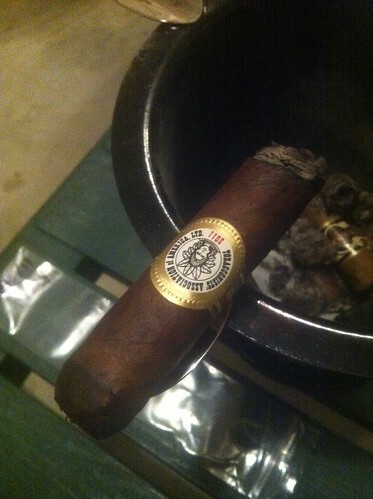 Today it was the NHC Selecion Limitada 2010; wow, lots of pepper on this one. Might be the spiciest Pepin I've had yet and I am enjoying it immensely. Thanks again so much.